WAGHENAER - Verthoninghe van zee Cuften van Bretaignen. . .
WAGHENAER, L. J. - Verthoninghe van zee Cuften van Bretaignen. . .
Verthoninghe van zee Cuften van Bretaignen. . . - WAGHENAER, L. J. Title : Verthoninghe van zee Cuften van Bretaignen. . ..
Map maker : WAGHENAER, L. J.. Date : Leiden, Plantijn, 1585. Size : 12.8 x 20.1 inches. / 32.5 x 51.0 cm. Description :DUTCH TEXT EDITION. 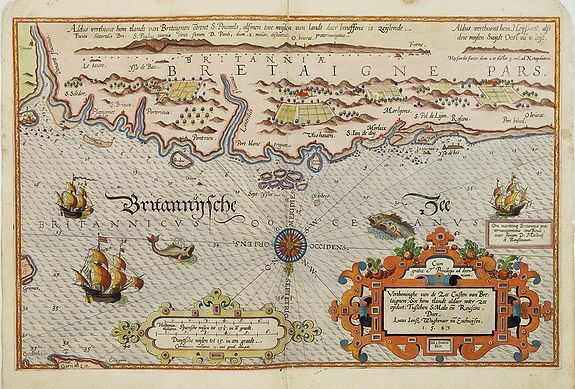 A detailed chart of the coast of Brittany decorated by a very colourful title cartouche and scale cartouche, one compass rose, several vessels and sea monsters. A very early edition rare Dutch text edition of this landmark contribution to the science of navigation. Waghenaer's own personal experiences as a pilot along European coasts were used to compile the Spiegel der Zeevaerdt, the first edition of which was published in Dutch at Leyden in 1584/85 by the house of Plantin. Although advertised as published in 1584 according to Koeman this edition is more likely printed in 1585. The chart is engraved by the famous artists Baptist and Johannes van Deutecom. The chart showing soundings, sandbanks, landmarks and coastal profiles. Condition : Small marginal spotting. Some small worm holes in upper part of chart. Else good condition.